Our need to store data is growing at an astonishing rate. An estimated 2.7 zettabytes (2.721) of data are currently held worldwide, equivalent to several trillion bytes for every one of the 7 billion people on Earth. Accessing this data quickly and reliably is essential for us to do useful things with it – the problem is, all our current methods of doing so are far too slow. Conventional hard-disk drives encode data magnetically on spinning discs, from which the data is read by a sensor that scans over its surface as it rapidly rotates. Their moving parts introduce the potential for mechanical failures, and limits the speeds possible. This slows everything down. Much faster are solid-state storage devices, which have no mechanical parts and store data as tiny electrical charges. Most modern laptops, all modern smartphones and digital cameras, and many other devices use this technology – also known as flash memory. However, while solid-state devices are much faster they have a much shorter lifespan than hard disks before becoming unreliable, and are much more expensive. And despite their speed, they’re still far slower than the speed at which data travels between other components of a computer, and so still act as a brake on the system as a whole. A solid-state drive that encodes data magnetically would be ideal. IBM is developing one variation, known as racetrack memory. 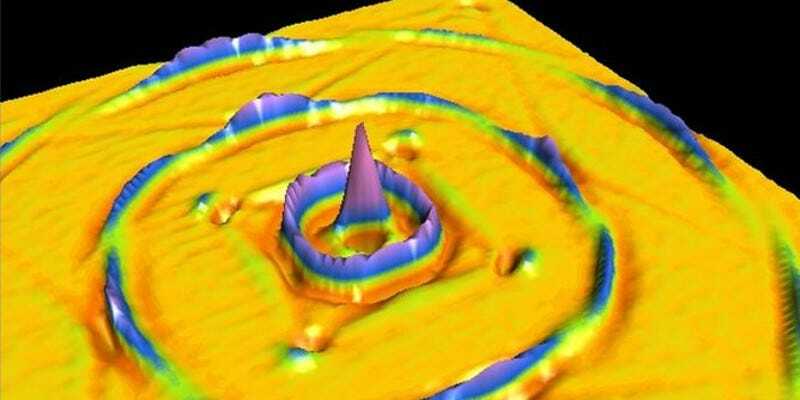 This uses collections of tiny nanowires hundreds of times thinner than a human hair. Data is magnetically encoded as strings of ones and zeros along the nanowire, but although it can move data through it far faster than typical hard disks, a key challenge is to find ways to make the data “flow” through the nanowires in order to pass it across the sensors that read and write data to the wire. This can be achieved by applying magnetic fields or electric currents, but this generates heat and reduces power efficiency, affecting battery life. There are other ways of moving magnetic data, however. My group at the University of Sheffield in conjunction with John Cunningham at the University of Leeds have been using simulations, now published in Applied Physics Letters, to explore ways of making racetrack memory more efficient and stumbled upon a surprising solution using sound waves. In our simulations we created vibration-sensitive magnetic nanowires on top of layers of piezoelectric materials, which stretch when we apply an electric voltage. By applying a rapidly-switching voltage they begin to vibrate, creating a special sort of sound wave known as surface acoustic waves. Using this method we created two sound waves, one flowing forwards along the nanowires and one flowing backwards. These waves combine together to create regularly spaced regions of the nanowire which vibrate strongly separated by regions that don’t vibrate at all. Our research shows that the magnetic data bits are attracted to and held in place at the strongly vibrating sections. If we then change the pitch of two sound waves, so that one “sings” a higher note and one a lower note, we find that vibrating regions start to flow along the nanowire, pulling the data bits with them just as is required for racetrack memory. If we switch the notes around, the data flows in the opposite direction. Using only sound alone it’s possible to move data in both directions. At the moment our simulations show data flowing at around 100mph (160kph). This sounds pretty fast, but we’d like it to be ten times faster. However the really exciting implications of this stem from the unique properties of surface acoustic waves. Because they only exist right at a material’s surface they lose energy very slowly, and can travel as much as several centimetres (which is huge when you consider the tiny size of the nanowires). Because nanowires are so small a single pair of waves could be applied to a very large number of wires, and therefore the data within them, at the same time. Potentially this makes it a very power efficient way of moving lots of data around quickly. There are still a lot of questions that need answering before we’ll know whether this technology is really the solution to the problems holding back racetrack memory. But with these promising initial indications, the next step is to create an experimental prototype to test it for real.